He was so scared — but he knew they'd keep him safe. 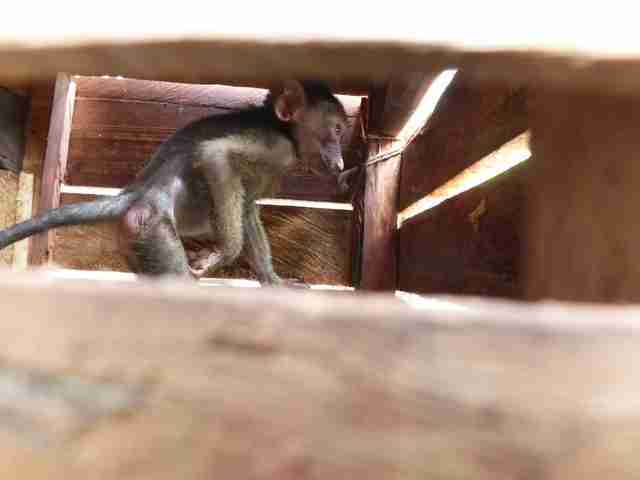 Just after a little olive baboon was seized from a smuggler in Cameroon back in April, no one knew what kind of damage had been done to him. He was brought to Limbe Wildlife Center — which is managed by the Pandrillus Foundation and works with the Cameroon's Ministry of Forestry and Wildlife to help wild animals in the region — where experts assessed what he needed most. "Although he spent little time in captivity and was in relatively good body condition at arrival, proper behavioral rehabilitation procedures will be required before we can introduce him to the group," the rescue center wrote. Four trained caretakers interacted with the baboon, whom they named Kuma. They focused on stimulating his curiosity and his playfulness to keep him healthy and close to his natural tendencies. 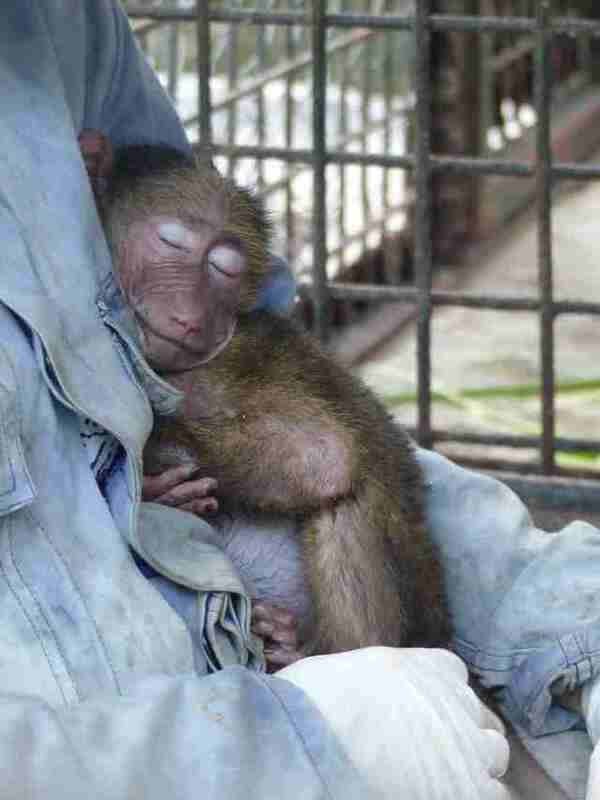 "During the first work sessions, [he] spent most of his time sleeping on the caretaker," the rescue wrote. "In such circumstances, we give time to the animal to rest as it is a way to build a trust relationship while releasing accumulated stress." By July, Kuma was already more confident. 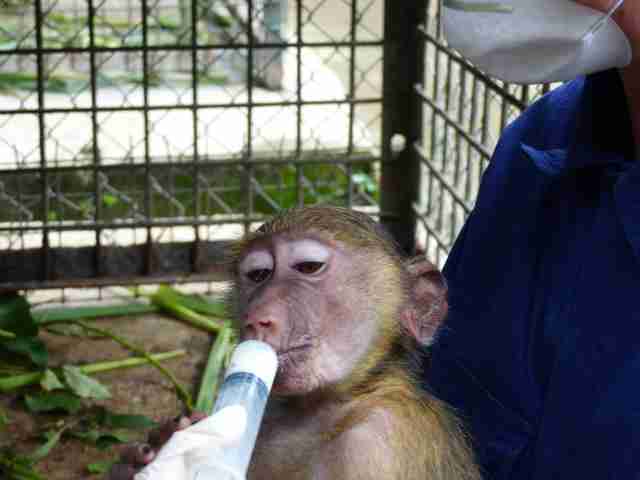 Even though he was less than 1 year old and still needed to be bottle-fed milk, he was curious and playful in his enclosure, where he was quarantined until it was safe enough to introduce him to other baboons. 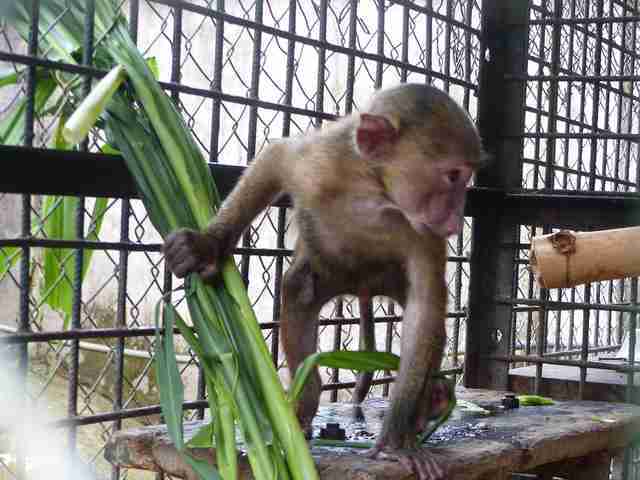 "Our quarantine staff spend time with him in his cage several times a day to feed him, to play and to groom as an adult olive baboon would do," the rescue center wrote. "He loves that!" By August, Kuma was ready to meet someone very special. A grown-up olive baboon at the center named Bameta was about to become Kuma's surrogate mom. First, they met by going into adjoining enclosures, and their mutual enthusiasm was obvious. Bameta reached through the fence to stroke and groom the baby baboon. Soon, they were let into the same enclosure — and they just couldn't stop playing together. "The first hour, they played. The second hour, they played," the rescue wrote. "The third hour, Kuma was exhausted and instead enjoyed a pleasant grooming session with his surrogate mother!" Bameta was gentle but firm with Kuma, which is exactly what he needs at this stage in his development, according to the rescue center. 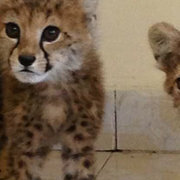 "Now, he is closer to Bameta, and has more and more faith in her," the rescue center wrote. "He knows that even asleep, she will carry him." This relationship between Kuma and Bameta is key to getting Kuma accepted into the baboon group. And as their bond strengthened, it was soon time to let Kuma meet his whole new family. After introducing Kuma to them by putting him in an enclosure where they could see him, Bameta brought Kuma to meet the group in their natural area of the rescue center without any barriers. "She invited him on several occasions before he finally jumped into the natural ground," the rescue center wrote. "A few minutes after, he was already climbing small trees and foraging the ground like a normal wild infant olive baboon." It's hard to imagine what Kuma's life would have been like if authorities hadn't seized him from smugglers mere months before. Luckily, there's no need to think of that. "He has immediately become the darling of the group!" the rescue center wrote. It isn't just Kuma — Limbe Wildlife Center cares for hundreds of animals saved from the illegal wildlife trade. You can help them.